Older people are suffering the ill effects of the cutbacks and they stand in solidarity with their children & grandchildren who are also suffering. 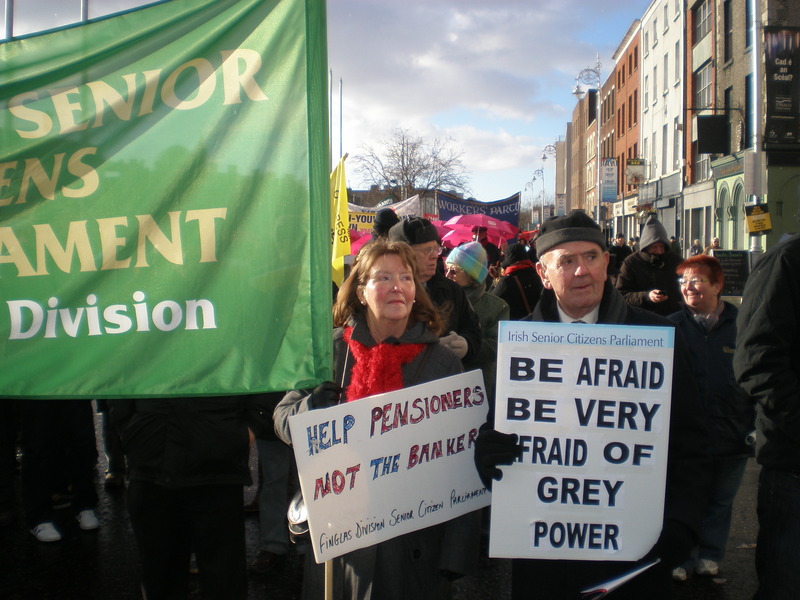 This is why the Irish Senior Citizens Parliament will proudly march alongside trade unions and other community groups before Budget 2013 on Saturday next to say “No to Austerity”. We are asking all our members around the country to walk alongside us with dignity & respect to show the Coalition government that we have had enough of the recession, enough of the cuts to income and enough of the threats to the travel pass. The last Budget saw a vicious cut to the means tested fuel allowance thus increasing fuel poverty. So walk alongside us … but wrap up warm with good shoes and scarves and gloves. This time however we want you to wear different shades of grey to symbolise the many hits we’ve taken. But we are not without hope – wear a sprig of green as well to show that we still have hope. And what about some “Greys in Shades” – wear some sunglasses as well. Why not just shoot us?